I used to always be known for saying that MomMomOnTheGo has 3 kids, 3 dogs, 3 cats, and a bunny. It helped explain how I got the name MomMomOnTheGo. Sadly, over the last year and a bit, the number of dogs that I could say we had kept decreasing until over the weekend I could no longer say that we had a dog. Yes, we are feeling a lot more empty in our household, by being down 3 canine fur babies. 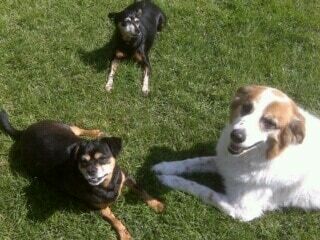 All three of our dogs lived awesome, long lives. They all lasted 15 years, not long enough in all truth. 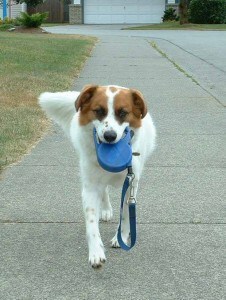 We lost Mickey, the white and tan border collie cross last May. 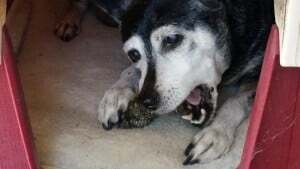 Then this past March, we lost my Zena girl. This past weekend we lost Tigi. Tigi we did not have since a puppy like the other two. Tigi we rescued and gave her a great life for the time that we had her which was about 13 of her years. They all had their own special personalities and place in our hearts where they will always remain. I have had an outpouring of support from so many fans and I really appreciate the tributes that you are doing and lovely words you are sending my way. It helps more than you know and means a ton to me and my family. Barkbox heard of our loss this last weekend and they did something that left me speechless, crying, and in an emotional awe that I have never felt before. 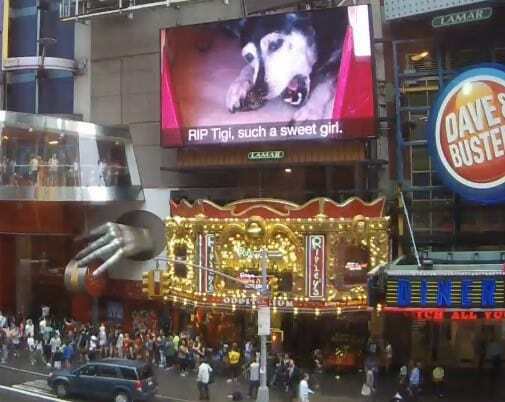 They made sure that my Tigi had an awesome tribute and remembered by many, by putting a tribute to her in Times Square. I already was in love with BarkBox and this type of celebration of a doggy life says it all for why I loved the BarkBox people, brand, company, and products. I was so happy to have discovered BarkBox before Zena and Tigi passed away so that they could enjoy getting amazing monthly mail. They really loved their BarkBoxes. When we finally are ready to get another canine baby again, they will get a Barkbox every single month. This I know to be true. 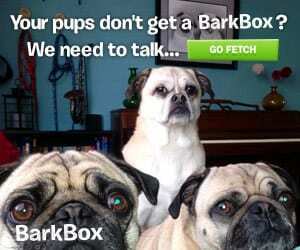 As if BarkBox has not celebrated my dogs’ loves enough, but they have offered up a wonderful giveaway for my fans of a 3 month BarkBox subscription. This giveaway is open to residents of Canada and the US who are over the age of 18 and where permitted by local laws to enter and win giveaways. Please ensure that you read the full terms of conditions found at the bottom of the entry form. My partners dog would love the Bixbi daily essentials chicken breast jerky treats. My dogs would love any toys with squeakers. They LOVE getting new toys And treats! My dogs love toys and they especially like new ones. Anything with a squeaker! And treats! My dogs love getting new toys. I’d be excited to see new toys. It would be the treats unless there is a small squeaky racoon stuffy. My sweet little girl Alice loves her Treatzies and Chewies. My dog would love the treats! Toys…Treats…the question is what wouldn’t my dog like to try! I think he’d love everything that came in a box made just for him! BeneBone Bacon Flavor would be one ! My pup would love a Just Right box with tasty chicken flavored treats; her favorite. They sound like great boxes and what a sweet thing they did for you! My two would love to try any of the stuffies that come in the boxes, they love their toys! My dog loves salmon treats so I would love to surprise him with the Thinkers Natural Salmon Smart Dog Treats. My pooches would love to have a Zogoflex Bumi Tug Toy in their box, they love playing tug of war!! 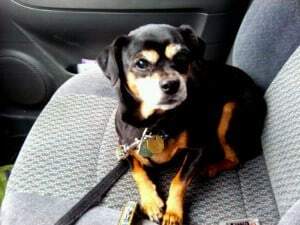 I would like the healthy treats for my dog Cleo who is 9. Don’t know were the time went! sorry for your loss. my daughter lost her fure baby last week . She was almost 17. It was a very hard day.